"NEVER QUIT"&"ALWAYS BELIEVE IN YOURSELF"
Exclusively Ours! An Allan Robin Design. Our Bracelet And Charms Comply With All Laws, Lead, Nickel, & Cadmium Free! 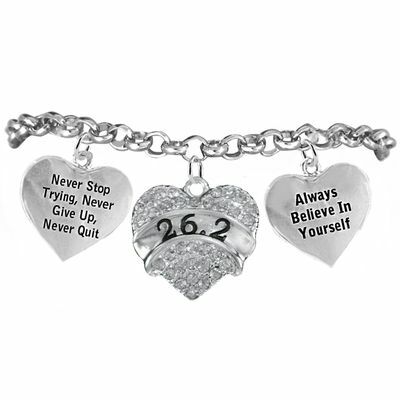 Silver Tone and Genuine Sparkling Clear Crystal Covered "26.2" Heart Shaped Running / Walking Themed Charm Framed By Detailed Silver Tone "Never Stop Trying, Never Give Up, Never Quit" Heart Charm (w1589sc) & "Always Believe In Yourself" Heart Charm (w1587sc) Comes On A Beautiful Lobster Clasp, Chain Link Bracelet. You May Also Add Additional Charms Of Your Choice On Each Side Of The Charms Shown Above, And See More Charms Below.